‘Siren’, like all the best words, has multiple meanings. On the one hand, it can refer to “a loud prolonged signal or warning sound”, heralding the kind of danger that wreaks through Jan Carson’s glorious second novel, The Fire Starters. 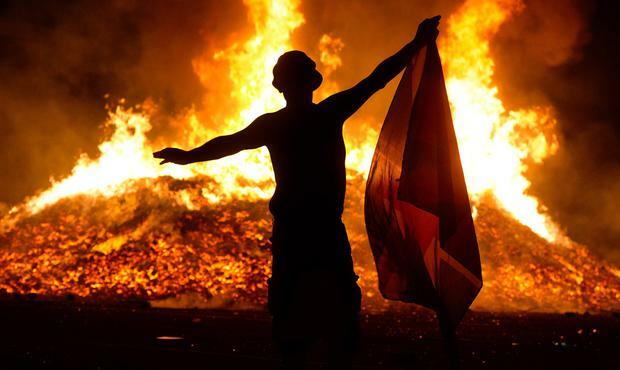 Here, we find Belfast ablaze, towering bonfires appearing all across the city, while online a video also spreads like wildfire. Set to the anarchic screech of the Prodigy’s ‘Firestarter’, the viral clip features an anonymous figure in a Guy Fawkes mask inciting civilians to join in the carnage and set their city alight. Jonathan Murray, however, is oblivious to the mounting panic – and the mounting flames – for he has just become a father for the first time. As if the sleepless nights and overflowing nappies aren’t enough, we soon learn that his daughter’s (now vanished) mother was, in that other sense, a siren – a mythological woman whose voice caused destruction to men. So Jonathan must desperately try to figure out how to stem baby Sophie’s lethal power before she opens her infant mouth and learns to speak. Across the city, Sammy Agnew is also terrified of the destructive traits his child has inherited. He longs to tell his teenage son, Mark, that “violence is a passed-down thing, like heart disease or cancer. It’s a kind of disease”. Sammy was once a very violent man, part of a Loyalist paramilitary group fond of setting Catholic cars alight; a pastime which has been reignited in his memory by the recent spate of flames. In our own recent times, with the “loud prolonged signal or warning sound” of Brexit ringing daily in our ears, Northern Ireland has found itself firmly in the spotlight. However, several excellent works of fiction have also served as fresh reminders that the North is so much more than just a ‘border’ and a ‘backstop’; that, like all the best places, it has multiple meanings. There has been Wendy Erskine’s delightfully droll story collection Sweet Home and Michael Hughes’s Homeric re-imagining Country. There was also, of course, Anna Burns’ Milkman, with its formal eccentricities and deliberate omission of character names and geographic details. The novel’s most notable strategy, however, is its use of magic realism. As well as Sophie’s mythological mother, we encounter a whole host of other-worldly characters, from ‘The Girl Who Could Only Fall’ to ‘Lois, The Daytime Vampire’. This will come as no surprise to readers of Carson’s previous novel, Malcolm Orange Disappears, or her story collection Children’s Children, where the political and the magical are also combined to powerful effect. Indeed, Carson is part of a growing number of Northern Irish women writers – such as Roisín O’Donnell and Bernie McGill – who have found themselves drawn to the fantastical when wrangling with the Troubles. Carson’s playfulness delights again and again, even as she explores her city’s darkest corners. Sound the siren: this novel truly burns bright.